29-Dec-2014 marks the 124th. anniversary of the massacre of The Lakota Sioux under Chief Big Foot of The Miniconjou Sioux at Wounded Knee, less than 2 weeks after the murder of Sitting Bull by US Cavalry at Standing Rock Reservation. Similarly 29-Nov-2014 was the 150th. anniversary of the massacre of 1864, by the Militia of Colonel John Chivington, of a defenceless Cheyenne and an Arapaho villages at Sand Creek (Soldier Blue portrays this most aptly and the song by the native American Indian Buffy Saint Marie says it all! CLICK HERE her rendering of ‘Bury My Heart At Wounded Knee‘ is spectacular!). CLICK HERE was this a rehearsal for Mai Lai or just an indication of the value Politicians and the military place upon Treaties? Consider the corrupt basis of The EU and the clear lack of meaningful democracy – A massacre of liberty & democracy, freedom & justice by stealth! The Irish may care to learn from the wisdom of the Indigenous peoples of America – Never trust a treaty signed against one’s better instincts, against one’s will and sold to such an extent that they were prepared to lie. Sadly this so very much applies to virtually ALL aspects of the relationship these United Kingdoms have with The EU – wherein our own politicians and Snivil Cervants are OUR ENEMY within, as they have duped and betrayed us with monotonous regularity regarding The EU and have stolen our money to fund their own personal ambitions; Currently OUR politicians are stealing £53 Million + a day to fund the failed, corrupt, depraved and undemocratic EU scam. Clearly a scam as all it provides is a blocking process for democracy and a rubber stamping process for the edicts of such bodies as WTI, WHO, CODEX, Davos, UN and the like who form the overarching global governance to whose tune the EU dances as it obfuscates democracyy, human rights, liberty, justice and trade – at an obscene and uneccessary cost. The Cheyenne, The Arapaho, Sitting Bull, The Miniconjou, The Lakota and Big Foot had binding Treaty Agreements with a nascent super State seeking to increase its control, that too was with catastrophic consequences. Some amongst The Irish will recall that John Major signed an agreement with The EU termed by The Sun newspaper on its banner front page as Game, Set & Match to Major yet it seems it was not valid since The EU have just arbitrarily overturned the Treaty – as did The Colorado Militia and the US 7th. Cavalry before them in creating their supra national state. As does the EU, by deceit, stealth and betrayal salami slicing away our liberty and freedoms without any meaningful democratic input!. It would seem that The EU is no respecter of agreements either and Ireland is to vote again to make it possible to claim they voted for their own demise as a Nation State! No massacre here just the death of democracy and self determination granted at great cost in 1922. & to think that Declan Ganley AND the British Tory Party, The Farage Party and his odious allies in The EU The Pan EU Political Party Group in The EFD with their racism, anti Judaism, anti homosexuality, sham so called christianity and violent xenophobic hatreds based on country, class and creed – they are so stupid as to believe that The EU can be changed from within! Sand Creek Colorado and Wounded Knee will hold no torch to the massacres and deaths that will result from the enforcement of The EU on a largely resistant peoples! As famine stalks the plains of EUrope due to the greed and stupidity of Politicians and as ‘The Wars of Disassociation’ become more determined! 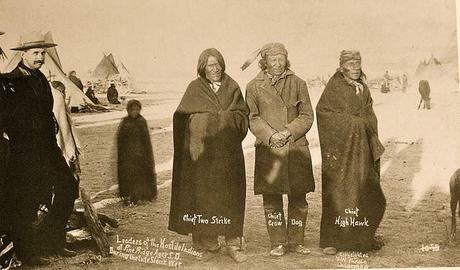 The Massacre at Wounded Knee drew its cause from the US Government policy of forcing the indigenous peoples to live on reservations and forgo their itinerant life style following the herds across their territories. Forcing the people to live in a manner alien to their traditions, life style and needs. The break down of indigenous culture led to a strong movement to restore their old ways led by the ‘Ghost Dancers’, seeking to restore the old ways and values, amongst the Sioux at Pine Ridge, which increasingly worried the Government. On the 15-Dec-1890 the reservation police entered the Pine Ridge area, S.E. of Rapid City South Dakota, to try to arrest the Sioux Chief Sitting Bull – an incident that led to his death, greatly increasing the tension in the area. The killing of Sitting Bull led to drafting in the US Army 7th. Cavalry who on the 29-Dec-1890 surrounded a group of the Ghost Dancers led by Big Foot, a Lakota Sioux Chief of the Miniconjou tribe of Sioux Plains Indians. The cavalry surrounded them at their encampment/village at Wounded Knee Creek and demanded they surrender their weapons. As this was taking place a fight started between one of the Sioux and a US soldier and a shot was fired. The 7th. Cavalry then went on to an uncontrolled massacre of between 150 and 300 of the Sioux villagers, about half of the casualties were women and children. The cavalry recorded a mere 25 casualties! The Massacre was originally passed off as a battle but was not only a tragedy but an undeniable and avoidable massacre. Surrounded by heavily armed cavalry it is hardly plausible that Big Foot with old men, women and children being predominant amongst his villagers would have deliberately started any kind of battle! It has been speculated by some historians that the massacre deliberately carried out by the 7th. Cavalry as revenge for the ignominy of their defeat at Little Big Horn in 1876. Whatever the cause or trigger of the massacre it was the last major incident in the US Government’s eradication of the Plains Indians and a final step in the control and destruction of the indiginous peoples of America. Let us remember not just those who died at Wounded Knee but the destruction of the entire culture of the indigenous peoples of North America.